You might also enjoy this video of the talk I gave at WebStock 2018 on Solving Diabetes with an Open Source Artificial Pancreas*. First, let me tell you that insulin is too expensive in the US. For some of the newer insulins like the ones I use, I pay as much as $296 a bottle. I have a Health Savings Plan so this is often out of pocket until I hit the limit for the year. People in America are rationing insulin. This is demonstrable fact. I've personally mailed extra insulin to folks in need. I've meet young people who lost their insurance at age 26 and have had to skip shots to save vials of insulin. This is a problem, but on the technology side there's some extremely promising work happening, and it's we have really hit our stride in the last ten years. I've been told every year the a Diabetes Breakthrough is coming "in five years." It's been 25 years. In 2001 I went on a trip across the country with my wife, an insulin pump and 8 PDAs (personal digital assistants, the "iPhones" of the time) and tried to manage my diabetes using all the latest wireless technology...this was the latest stuff 17 years ago. I had just moved from injections to an insulin pump. Even now in 2018 Insulin Pumps are expensive, mostly proprietary, and super expensive. In fact, many folks use insulin pumps in the states use out of warranty pumps purchased on Craigslist. Fast forward to 2018 and I've been using an Open Source Artificial Pancreas for two years. OpenAPS - Open Artificial Pancreas System. A platform for building a closed-loop with open tools. Loop/LoopKit - Open Source Artificial Pancreas running on the iPhone with a hardware bridge (RileyLink) to the pump. I run this pancreas, personally, and have for nearly 2 years. Watch Dana Lewis (the originator of OpenAPS) talk about OpenAPS at OSCON! The results speak for themselves. While I do have bad sugars sometimes, and I do struggle, if you look at my blood work my HA1c (the long term measurement of "how I'm doing" shows non-diabetic levels. To be clear - I'm fully and completely Type 1 diabetic, I produce zero insulin of my own. I take between 40 and 50 Units of insulin every day, and have for the last 25 years...but I will likely die of old age. This is significant. Why? Because historically diabetics die of diabetes. While we wait (or more accurately, #WeAreNotWaiting) for a biological/medical solution to Type 1 diabetes, the DIY (Do It Yourself) community is just doing it ourselves. Building on open hardware, open software, and reverse-engineered protocols for proprietary hardware, the online diabetes community literally has their choice of open source pancreases in 2018! Who would have imagined it. 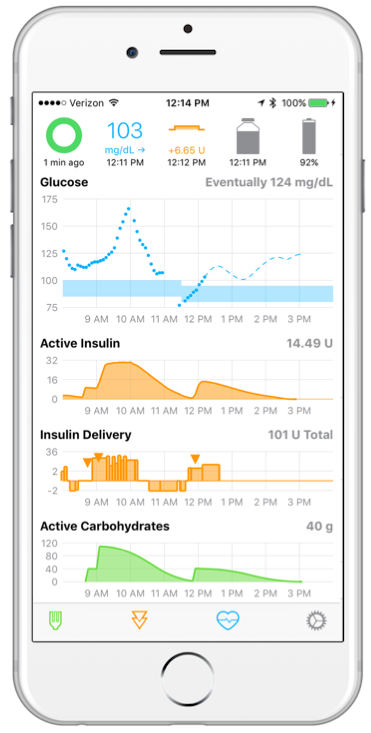 You can choose your algorithms, your phone, your pump, your continuous glucose meter. Today, in 2018, you can literally change the code and recompile a personal branch of your own pancreas. Watch my 2010 YouTube video "I am Diabetic" as I walk you through the medical hardware (pumps, needles, tubes, wires) in managing diabetes day to day. Then watch my 2018 talk on Solving Diabetes with an Open Source Artificial Pancreas*. I believe that every diabetic should be offered a pump, a continuous glucose meter, and trained on some kind of artificial pancreas. A cloud based reporting system has also been a joy. My wife and family can see my sugar in real time when I'm away. My wife has even called me overseas to wake me up when I was in a bad sugar situation. As the closed-hardware and closed-software medical companies work towards their own artificial pancreases, the open source community feel those companies would better serve us by opening up their protocols, using standard Bluetooth ISO profiles and use security best practices. Looking at the table above, the open source community is squarely in #4 and moving quickly into #5. But why did we have to do this ourselves? We got tired of waiting. * Yes there are some analogies, stretched metaphors, and oversimplifications in this talk. This talk is an introduction to the space to the normally-sugared. If you are a diabetes expert you might watch and say...eh...ya, I mean, it kind of works like that. Please take the talk in in the thoughtful spirit it was intended. This is incredible. I'm going to have to speak to all of the Type 1 diabetics I know (not many) and their families and make sure they know about this technology. It's fantastic what you and the open source community have done here, Scott. At the same time, it's really unfortunate that you need to be a open source tech junkie (something that 99% of diabetics most likely are not) to use this stuff. Today is my 46th diaversary and it's a great time to have diabetes. I'm using a Tandem X2 and just upgraded to the Dexcom G6. Last week I downloaded the Basal-IQ software update for the X2. It will stop insulin delivery if it predicts a low is coming and then start it again if you BGs are heading to a safe range or if it's been off for 2 hours. Since the upgrade I see the suspension several times each day, sometimes for 10-15 minutes and sometimes longer. It's given me the freedom to exercise more and worry a lot less. Next year I'm looking forward to their Control-IQ upgrade which will be much closer to the OpenAPS system. Only thing that's stopped me trying the OpenAPS is that I like my pump and its settings overall. I think going to an older model would be a step backwards for me. If only pump companies would open up their APIs! And yes, if only drug companies would stop the HUGE increases in insulin prices. Here's hoping for some generic insulin approval before too long. Lauriette de Ruiter - yes it works with NovoRapid or any other insulin you would use in a pump. If anyone is interested in further reading, this blog has some great articles about getting started with looping. You can even run as an open loop, manually reviewing suggestions and implementing or not the suggestions of the artificial pancreas.